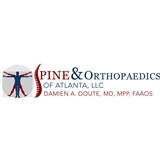 Spine & Orthopaedics of Atlanta (Tucker) - Book Appointment Online! I make every effort to get to know my patients and their concerns as much as possible so they feel as comfortable as possible with their treatment and care. I pride myself on delivering the most up-to-date treatment options in spine surgery and general orthopaedics. My goal is to give you, the patient, what you ultimately want for your health care, if possible. The practice focus is the treatment of spine problems, joint replacement, arthroscopy, treatment of hip and knee arthritis, treatment of fractures and injuries from sports and motor vehicle accidents. Beyond this our Specialties are simple and complex spine surgery and reconstruction, Neck and back surgery, Accident, injury and pain treatment.